A popular Chinese cabbage that is used for braising and stuffing. The cabbage is barrel shaped with crisp white stalks and crinkled leaves, which are pale green or yellow in color. 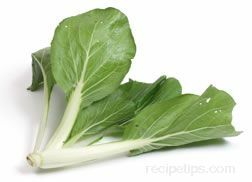 Short bok choy is ten to twelve inches long and has a diameter of approximately six inches. It is available throughout the year. When selecting, look for a firm compact head with fresh leaves. Store in the vegetable drawer of the refrigerator, wrapped in plastic, and the cabbage should stay fresh for at least 4 to 5 days. Also known as baby Pak Choy.